Consistently attract and retain great clients? Run a more efficient and profitable practice? Deploy a scalable growth model? Create a panoramic branding strategy? 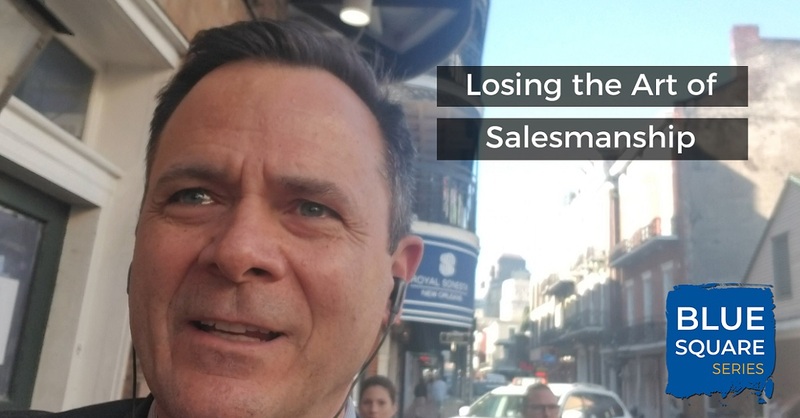 Many of the most successful professional advisors I know have increased their persuasive impact by radically altering their sales process with prospective clients. These advisors (many of whom used to be salespeople) have evolved into professional consultants; they now strive to attract new clients rather than chase them. 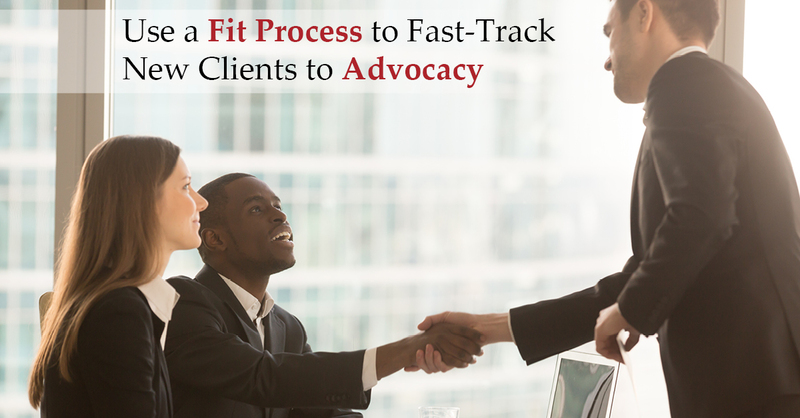 Instead of using the old-school sales process to close business, they use a fit process to fast-track new clients to advocacy. Steve Phillips is a longtime friend and partner of Duncan MacPherson and the entire Pareto Systems team, having first engaged with Pareto as a client in 2010. With over 25 years of experience in the financial services industry as a speaker, team leader and passionate educator, Steve was an early adopter of the processes around practice management, business refinement and client acquisition. 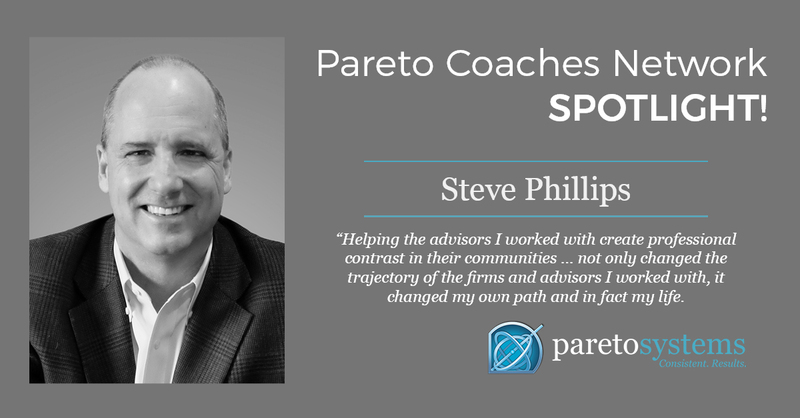 It was a natural next step for Steve to become a Pareto Certified Practice Management Consultant, and part of the Pareto Coaches Network. After living, working and consulting in Scottsdale AZ for 5 years, Steve and his wife Laurie recently moved back to their home city of Overland Park KS. They have two grown daughters, Lindsay and Leigha and stay busy being involved with them and other family members living in the Kansas City area. Steve and Laurie are movie buffs and also enjoy traveling. Interestingly, Steve's college study was herpetology and he spent those formative years collecting and working with venomous snakes. As he describes it, the study and love of the snakes and their natural history remains in his blood and he still gets out on collecting and observation trips with colleagues as often as he can. Pareto: Why did you buy into Pareto’s process as opposed to what the industry was doing? Steve: Pretty simple actually. After doing presentations for thousands of advisors over 15 years, it became increasingly clear that the path to sustainable growth for already successful advisors was not around product or marketing. Moreover, the idea of working with the ‘already convinced’ in a practice, and turning current clients into advocates who then became the best client acquisition initiative anywhere, was the absolute proof that these proven processes work year after year. Helping the advisors I worked with create professional contrast in their communities and seeing what a shift to a philosophy, planning strategy and process approach meant to creating enterprise value in a firm, not only changed the trajectory of the firms and advisors I worked with, it changed my own path and in fact my life. Pareto: After becoming a founding member of the Pareto Coaches Network you founded the initial version of Advisor Protocol nearly five years ago and I know that through the collaboration with Duncan and Pareto Systems you’ve seen significant growth in the last several years. Talk to me a little about what AP does for its advisor clients. Steve: Well first, all of us at Advisor Protocol are thrilled to have had this relationship with Pareto for the last 5 years and Duncan has certainly been a guiding resource for us all along the way and was instrumental in the idea around what Advisor Protocol could become. We take the “In Collaboration with Pareto Systems” very seriously. We’re actually a brand and coaching consultancy, so we develop and create personal and professional branding strategies, which of course leads advisors to articulating their value so that clients and prospects fully and completely understand and appreciate everything they do. 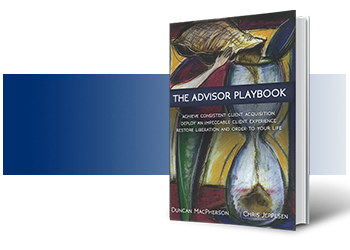 As Duncan would say, we help advisors take the 50 or 80 or 100 things that they may be able to provide to a client over the life of a relationship, condense it into the 7 Pillars and then down to the One proprietary Process. We provide client-facing branded marketing pieces all based around the principals taught in the Pareto System, TCE and Blue Square. We don’t let our advisors confuse a logo or fancy marketing pieces with the brand though. When you think of famous logos like Nike or Apple those are not just logos or pictures. They are the outward-facing representation of a deeply seated brand. 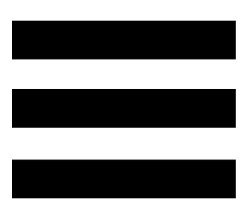 For example, when you see the Nike Swoosh what do you think? “Just do it” of course. That’s a brand not a logo. So we work deeply with our advisor clients and their teams to identify, capture and bring to life their unique brand. You can imagine then what happens when we create the client pieces or provide coaching, not to mention the reaction of clients and prospects after the brand has been created. Pareto: So in short, what affects or changes have you seen on the practices of advisors who participate in the AP program? Steve: Well within a matter of weeks of engaging with us our advisors see an increase in the quality and quantity of introductions they receive. The Pareto mantra of course. The thing is, is that once the brand is created and advisors can communicate it with passion and emotion, it of course gives clients a compelling way to share the experience they have with their advisor with friends and family members and instead of “sending referrals” they now “make the introductions.” And there’s a big difference there, as you know. Additionally, the strategies apply to both new client acquisition and to re-framing of current client relationships so think retention as well. Steve: Again, applying what we’ve learned from Duncan and through our own experience with advisors, I think it’s safe to say that competition and commoditization will continue to increase and not go the other way and we believe, and have heard from some of our client advisors, that retention might be the most important aspect when it comes to increasing the enterprise value of their firms. So through our branding and coaching we teach our advisors that “the words matter” whether or not they’re speaking with a new client for the first time or re-framing the relationships of their best clients. The opportunity to create professional contrast always exists, maybe now more than ever. 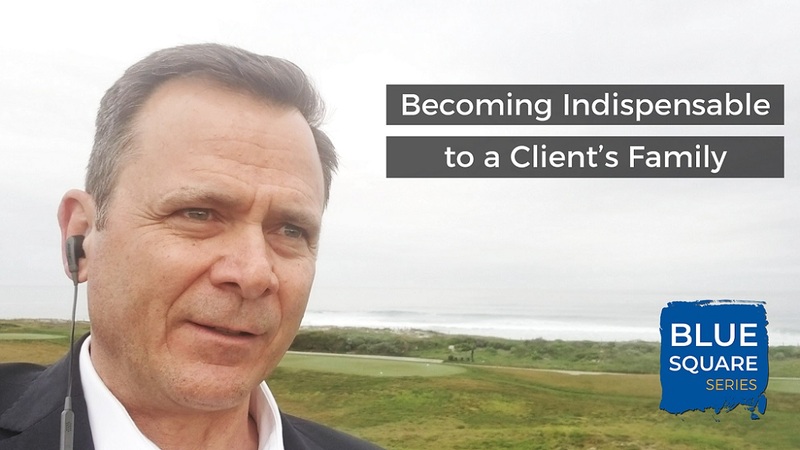 The focus always has to be on providing an elevated and perfected client experience, and to move prospects and clients up the loyalty ladder to advocates. To date we are extremely pleased and gratified about the response we have received and certainly about the ongoing collaboration with everyone at Pareto. Put a process in place that puts every piece of your client’s financial puzzle together that goes beyond just achieving financial independence, but also maintaining it and building their family legacy. The office experience you create is an extension of your personal branding. 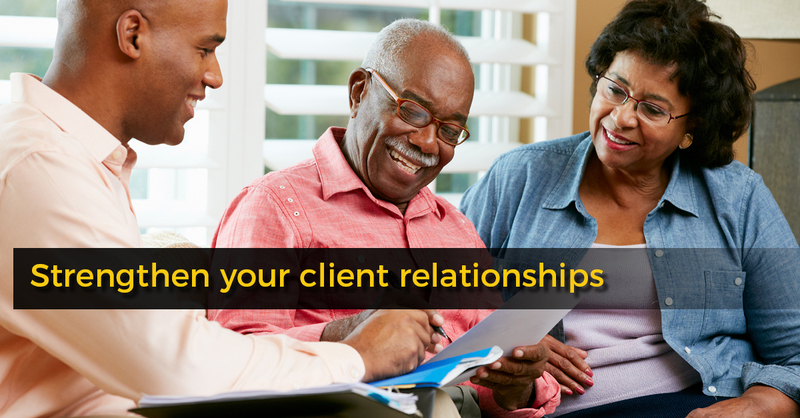 It helps clients connect with you on a deeper level. Consistent service, expectation management and performance will always be primary factors when it comes to long-term relationships, but there are many other factors you can utilize to help insulate your relationships from the things outside your control. How clients feel about you, especially when they meet with you in your office, contributes to their sense of belonging, which can contribute greatly to refer-ability. I can also tell you this: Many advisors have told me that their clients mention how much they love their advisor’s office environment and team culture when they are describing that advisor to a friend. When it comes to practice management, a lot of attention must be placed on the client experience. 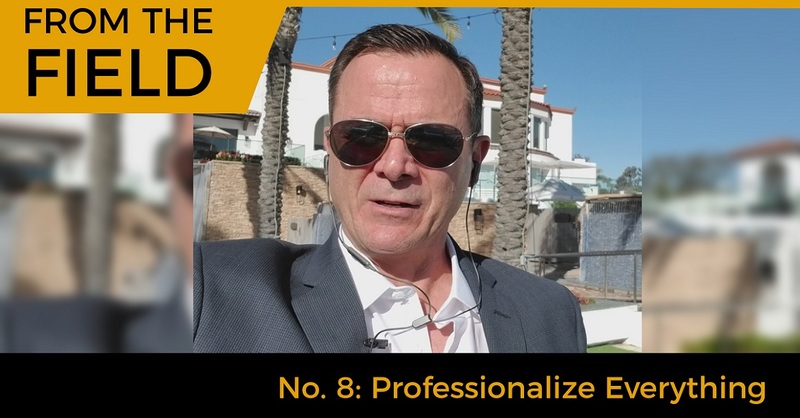 Using an agenda, having a fit process, onboarding a client systematically and deploying a service matrix are just a few of the essentials that I help advisors put into action to project professionalism and strengthen their client relationships. Professionalize your deliverables with processes to make yourself indispensable to your clients and stand out from the crowd. 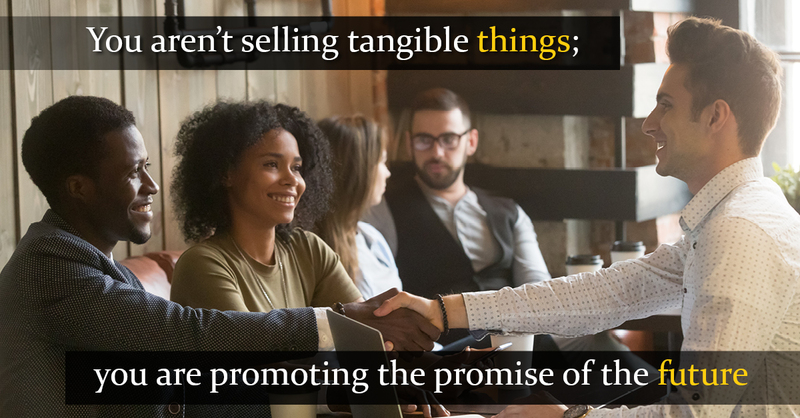 You aren't selling tangible things; you are promoting the promise of the future. You are a knowledge-for-profit professional. Your knowledge is your livelihood. I’ve said it before but it’s worth saying again. You aren’t selling tangible things; you are promoting the promise of the future. When it comes to relationship management and client acquisition, it is essential that you take the abstract nature of your business and make it easier to conceptualize by providing people concrete things they can hold in their hands. 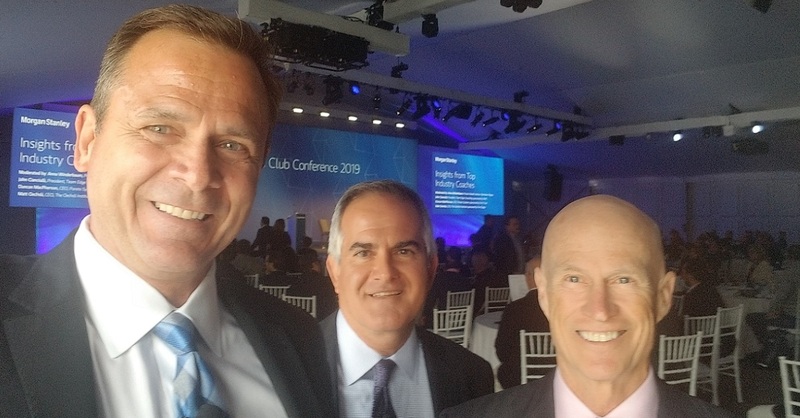 At Pebble Beach for a Chairman's Club conference on a panel discussing growth with Matt Oechsli, MBA and John Cianciulli. We got to hear Justin Rose speak just before us talking about balance and incremental improvements. 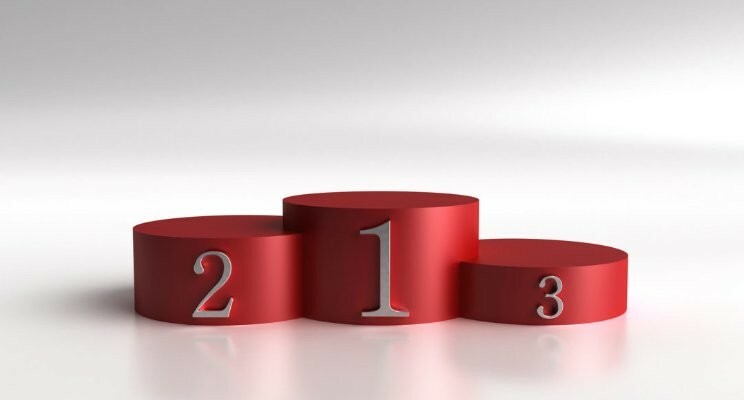 What Separates the Best From the Rest? Why are some Financial Advisors more effective than others? To validate this, we often scrutinize what separates the best from the rest in this business. We look at why some advisors are more successful than others and what it is they are doing that others don’t. But what’s really fascinating is that this study transcends the financial services industry. The most successful consultants, accountants, dentists and other skilled professionals aren’t just effective at their core roles, they are also proficient at creating exceptional client experiences that lead to loyalty and refer-ability. The quality of the core deliverable is crucial, but that alone is not enough. One of my favorite examples would have to be dentists. One of the most important things dentists realized was that their time is their most valuable asset. Your dentist doesn’t call you to confirm your next cleaning. Someone else does that (in fact, try to get your dentist on the phone. It’s not easy. They guard their time.). A good dentist creates organization and structure and empowers people who make $25 per hour to do $25 per hour tasks. In the process this liberates the dentist to focus on what he or she gets paid to do while creating scarcity that is attractive. Somewhere along their specific evolutionary curve, dentists also clued into the fact that their vocation was close to the top of the list of professionals that many people despised, and then they got smart and did something about it. They started concentrating on the things that they could control. One thing they could control was preparing an environment that was so memorable and relaxing that people felt great even though they were visiting the dentist! With this historical move, dentists finally realized that they too could make use of word-of-mouth advertising! For the first time, people were talking about their dentists, and yet it wasn't in the context of pain! They were talking to their friends, families and colleagues about this special brand of 'instant rapport' that they had experienced, and it was at a dentist's office! People hearing about such things could have remarked to themselves: "I must check this out! My dentist basically uses pliers and rum!" The other smart thing that successful dentists did was to help their patients map out a foundation for good dental health. As a part of this foundation, clients were taught that they would need regular and never-ending visits to the dentist to ensure that this strategy for good dental health was to succeed. In other words, it was an ongoing process that never ended until the patient died or lost his/her teeth. Clients are trained to empower their dentist. Every new service provided by a dentist is communicated to clients in a forthright manner and positioned as a benefit to the client rather than as a sales opportunity. Clients become aware of their unmet needs before they even realize the need exists. And they take action. Where is this all going? Is it such a stretch to think that we can implement the same kind of atmosphere and professional processes into the office of a financial advisor? Dentists realized at some point that the overwhelmingly negative public predisposition toward their kind was out of their control. Once they started mastering the office visit and educating their clients about the link between great dental health and how that was directly proportional to a lifelong relationship with their dentist, they have never looked back. The good dentists attract, they don’t chase. Is it your fault as an advisor that the markets are volatile and the future is uncertain? Not in the least. However, if your clients tend to refer you only when things are rosy in the markets, you have a serious vulnerability in the way that you have positioned yourself with your clients. Things do not have to be this way! If advisors would simply take a page or two from a profession that has already gone through this brand of disharmony, they would finally have a business where clients can and will refer them regardless of how the markets are doing. This is not a pipe dream. There are advisors who have already integrated these things into their businesses as we speak. These advisors have clients who have been taught the doctrine and who are not faked out by volatility. As a result, because their clients' expectations have been exceeded in the areas that the advisor can control, these advisors are immensely referable 365 days out of the year. What's Holding You Back? Your Clients WILL Embrace This Approach! When 'instant rapport' takes place at your office and the experience is coupled with a Client Process where the complexities of financial planning have been simplified and “future-paced”, clients will embrace your efforts. They will also realize that it would be a disservice not to recommend this five-star service to others they know who are unhappy with their financial advisors. Through a crystal-clear Client Process, clients are taught that financial planning is not an event, but a process that involves ongoing interaction with their financial advisor, repetitively and forever as their lives and needs unfold. Like the dental mantra, clients can learn a financial mantra and will deliver it to others just as naturally and eloquently. With this kind of structure, to blame a financial advisor for an occasional or sustained hit to a balanced portfolio would be akin to blaming a dentist for your root canal. The end result is that the 'instant rapport' and the Client Process are what the clients learn to value in dealing with the advisor instead of fixating on the rate of return on their investments. Finally! This is what we've been waiting for! Typically, when affluent prospective clients hear about a superior brand of advisor, they will distance themselves from the transaction-oriented advisor as quickly as possible and gravitate to the full-service advisor. The bottom line is that everything – every action and reaction – executed by you and your team makes you either more or less refer-able. Scrutinize everything and create a refer-able experience. Create professional contrast with stewardship, not salesmanship. Don’t try to be all things to all people, but all things to some people. Demystify your value and let people come to their own conclusions.